For those not familiar with tartrate crystals, seeing them at the bottom of your wine bottle or wine glass could cause alarm. But not to fret, tartrate crystals are a natural occurring substance in some wines and are totally harmless. When tartaric acid and potassium combine under very cold temperatures, they create a compound known as potassium bitartrate, which is basically a salt. Typically this happens during fermentation and the crystals attach themselves to the fermentation vessel walls, not in the wine. 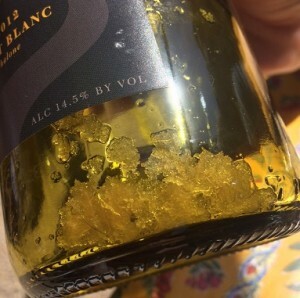 But in some wines, more complex ones, the crystals may form at a later state, such as in the wine bottle. Nope. There is a method called “cold stabilization” that can separates the tartrates from the wine and then the wine is filtered to remove them. Actually, higher end wines are more likely to have tartrates since many are not fined or filtered in order to preserve the nuances and complexity of the wine. Though they are found in both red and white wines, they are typically more noticeable in white wines.